Not to be confused with Tompkins, New York. Tompkins County comprises the Ithaca, NY Metropolitan Statistical Area. 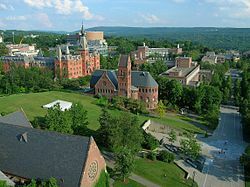 It is home to Cornell University, Ithaca College and Tompkins Cortland Community College. When counties were established in the British Province of New York in 1683, the present Tompkins County was part of Albany County. This was an enormous county, including the northern part of New York State as well as all of the present State of Vermont and, in theory, extending westward to the Pacific Ocean. This county was reduced in size on July 3, 1766 by the creation of Cumberland County, and further on March 16, 1770 by the creation of Gloucester County, both containing territory now in Vermont. Herkimer County was one of three counties split off from Montgomery County (the others being Otsego and Tioga counties) in 1791. Onondaga County was formed in 1794 by the splitting of Herkimer County. Cayuga County was formed in 1799 by the splitting of Onondaga County. This county was, however, much larger than the present Cayuga County. It then included the present Seneca and Tompkins counties. In 1804, Seneca County was formed by the splitting of Cayuga County. On April 7, 1817, Tompkins County was created by combining portions of Seneca and the remainder of Cayuga County. The county was named after then Vice-President (to President James Monroe) and former New York Governor Daniel Tompkins. Tompkins almost certainly never visited the county named for him. In 1854, the county lost the town of Hector and the west line of lots in Newfield to the newly formed Schuyler County, New York. According to the U.S. Census Bureau, the county has a total area of 492 square miles (1,270 km2), of which 475 square miles (1,230 km2) is land and 17 square miles (44 km2) (3.4%) is water. Tompkins County is in the west central part of New York State, south of Syracuse and northwest of Binghamton. It is usually geographically grouped with the Finger Lakes region, but some locals consider themselves to be part of Central New York or the Southern Tier. As of the census of 2000, there were 96,501 people, 36,420 households, and 19,120 families residing in the county. The population density was 203 people per square mile (78/km²). There were 38,625 housing units at an average density of 81 per square mile (31/km²). The racial makeup of the county was 85.50% White, 3.64% African American, 0.28% Native American, 7.19% Asian, 0.04% Pacific Islander, 1.09% from other races, and 2.26% from two or more races. Hispanic or Latino of any race were 3.08% of the population. 12.4% were of German, 11.7% English, 11.1% Irish, 9.2% Italian and 6.0% American ancestry according to Census 2000. 2.85% of the population reported speaking Spanish at home, while 1.86% speak Chinese, 1.07% Korean, and 1.00% French. There were 36,420 households out of which 25.80% had children under the age of 18 living with them, 41.20% were married couples living together, 8.20% had a female householder with no husband present, and 47.50% were non-families. 32.50% of all households were made up of individuals and 8.10% had someone living alone who was 65 years of age or older. The average household size was 2.32 and the average family size was 2.93. In the county, the population was spread out with 19.00% under the age of 18, 26.00% from 18 to 24, 26.20% from 25 to 44, 19.30% from 45 to 64, and 9.60% who were 65 years of age or older. The median age was 29 years. For every 100 females there were 97.60 males. For every 100 females age 18 and over, there were 95.20 males. The median income for a household in the county was $37,272, and the median income for a family was $53,041. Males had a median income of $35,420 versus $27,686 for females. The per capita income for the county was $19,659. About 6.80% of families and 17.60% of the population were below the poverty line, including 11.00% of those under age 18 and 5.40% of those age 65 or over. Tompkins County was once a reliable Republican county. From 1916 to 1980, the only Democrat to carry it in a presidential election was President Johnson in 1964. However, Democrats have won Tompkins County in every presidential election since 1984. In 2008, Tompkins County was the only county in New York State in which Senator Barack Obama beat Senator Hillary Clinton in the Democratic primary. In the 2008 U.S. Presidential election, Obama won the county by a 41% margin over John McCain, with Obama winning by 25.5% statewide. It was his highest percentage by county in upstate New York. In 2016 the county strongly supported Clinton over Trump (67.7% to 25.6%), but was surrounded by Trump-supporting counties. The Tompkins County Legislature consists of fifteen members, each from a single-member district. In November 2014, the Tompkins County legislature unanimously adopted a resolution recognizing freedom from domestic violence as a fundamental human right. In doing so, Tompkins County became the first rural county in the United States to pass such a resolution. The eight-square schoolhouse or Dryden District School No. 5 is a one room schoolhouse just south of New York Route 13 in Dryden Township. The county is served by several school districts (the largest being Ithaca City School District), and several public libraries including the Tompkins County Public Library, the Southworth Library and the Ulysses Philomathic Library. ^ a b c "State & County QuickFacts". United States Census Bureau. Retrieved October 13, 2013. ^ "2010 Census Gazetteer Files". United States Census Bureau. August 22, 2012. Archived from the original on May 19, 2014. Retrieved January 8, 2015. ^ "Population of Counties by Decennial Census: 1900 to 1990". United States Census Bureau. Retrieved January 8, 2015. ^ "Language Map Data Center". ^ Menendez, Albert J. (2005). The Geography of Presidential Elections in the United States, 1868–2004. Jefferson, North Carolina: McFarland. pp. 261–265. ^ "New York Election Results 2016". Retrieved 2018-10-25. ^ "Freedom from Domestic Violence Recognized as a Human Right". tompkinscountyny.gov. Tompkins County. Retrieved 21 January 2015. ^ Popp, Evan (April 26, 2015). "Ithaca community takes back the night". The Ithacan. Retrieved 27 April 2015. ^ "NYSVoter Enrollment by County, Party Affiliation and Status" (PDF). New York State Board of Elections. April 2016. Retrieved July 30, 2016. This page was last edited on 26 February 2019, at 04:25 (UTC).